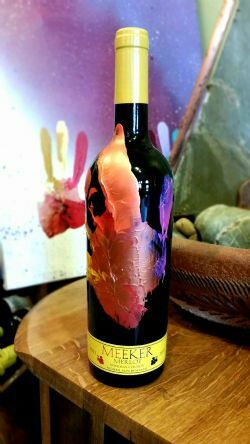 In the beginning, we put our handprints on these bottles so everyone would know it was a Meeker Merlot - big, fruit-forward, full-bodied, and with tannic structure for days. Now you know what kind of wine this is! But we keep handprinting because the bottles are just so darned gorgeous. And this 2014 Winemaker’s Handprint Merlot is a classic. Dark fruit like currants and cherries marry on the nose with hints of toffee and caramel. The wine explodes on your palate with more cherries, and hints of the best strawberry rhubarb pie you’ve ever had. There’s no shortage of subtle, toasty oak and big, powerful tannins throughout the palate and finish of this wine. This 2014 Handprint will age beautifully and develop more richness and roundness for years to come.